Pay Scale-51550-1230-58930-1380-63070 + other allowances. 1. 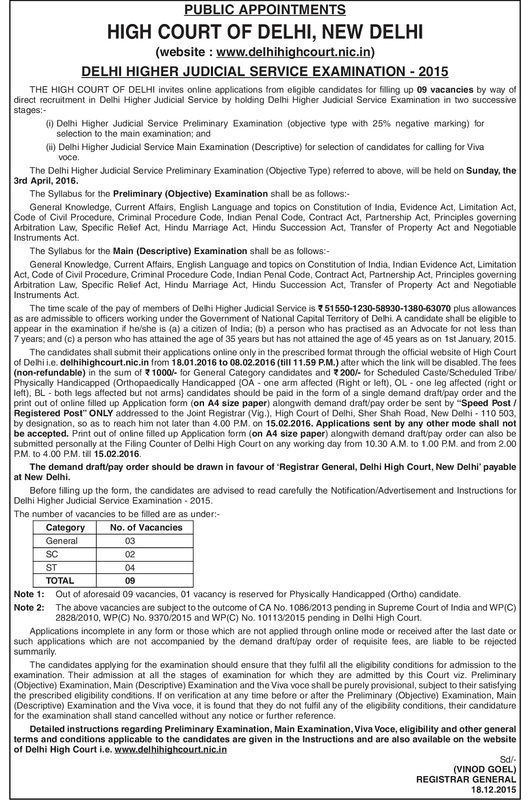 Delhi Higher Judicial Service Preliminary Examination (Objective Type Examination). 2. 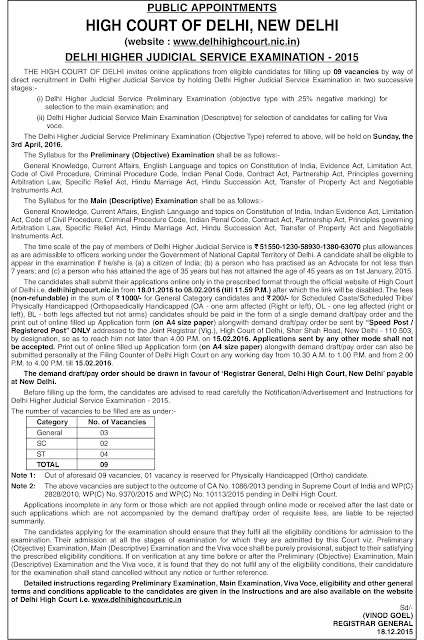 Delhi Higher Judicial Service Main Examination (Subjective Type Examination). Arbitration Law, Contract Act,Specific Relief Act, Hindu Succession Act, Hindu Marriage Act,Transfer of Property Act and Negotiable Instruments Act. Specific Relief Act,Contract Act, Partnership Act, Hindu Marriage Act, Principles governing Arbitration Law, Transfer of Property Act,Hindu Succession Act and Negotiable Instruments Act. 1000/- for General Category candidates and 200/- for Scheduled Castes/Scheduled Tribes candidates.Fee can be paid by Demand Draft/Pay Order in favour of Registrar General, Delhi High Court, New Delhi payable at New Delhi up to 15.02.2016. Address for Hard Copy of application- Joint Registrar (Vig. ), Delhi High Court, Sher Shah Road, New Delhi 110003.